Access control is a fundamental element of security in higher education, impacting every department and every stakeholder throughout an institution. However, costs are an obstacle, and many aging access control systems urgently need to be upgraded. Managing systems can also be a challenge, although there are new technology options that can make life easier for administrators as well as those who use the systems. 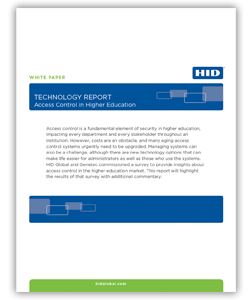 This technology report “Access Control in Higher Education” will highlight the results of that survey with additional commentary. Please fill out this form to access this resource.